The Funky Felter: Rubber Stamp Shop was Featured on Craft Gossip! 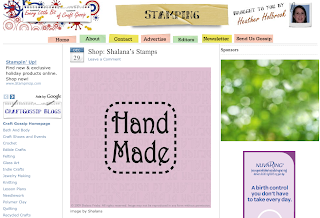 Rubber Stamp Shop was Featured on Craft Gossip! I just wanted to say "Thanks!" to the stamping blog editor, Heather, at Craft Gossip for featuring my new rubber stamp shop last week. I sold two of the featured stamp that day! Yay!